The SP40 Plus Multi Function Device is designed to be far more than just another Counter Point device to clutter an already overcrowded Counter Service Point. The SP40 Plus can be configured to satisfy a variety of applications for passbook or receipt printing in a Counter Point environment. 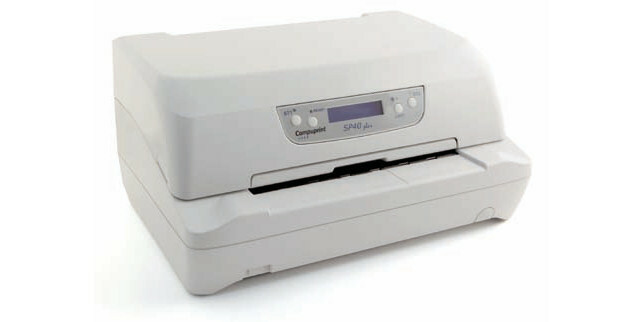 The device can also, or alternatively,incorporate dual side image scanner (600 dpi resolution at 24 bit colour) to scan up to A4 size documents, MICR/MSRW for handling of magnetic stripes on passbooks and recognition of the MICR characters on a cheque (E13B and CMC7) and therefore can operate as a Passbook Printer, Receipt Printer, Document Scanner (up to A4), Card Scanner (ID), Cheque Reader / Cheque Scanner, Magnetic Stripe Reader. The device is also available with a rear tractor feed for fanfold paper if required. All functionality required to satisfy a variety of financial applications is available within the SP40 Plus as a single device and can integrate into existing IT environments thanks to standard and financial emulations. The SP40 Plus standard interfaces are Parallel, Serial and USB2.0 (Full Speed). Other options include: LAN, additional Serial, additional USB device, up to 3 USB 2.0 ports (Hub/Host) for easy connection of other devices. The SP40 Plus innovative mechanical design makes it easy for the User to access the paper path to clear documents or periodic clean internal devices. Our objective is simple, to offer process efficiency and competitive low cost of ownership. The SP40 Plus is the ideal choice to deliver high productivity, durability, simplicity and flexibility.